A matrix represents a collection of numbers arranged in an order of rows and columns. It is necessary to enclose the elements of a matrix in parentheses or brackets. 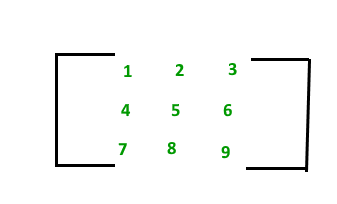 A matrix with 9 elements is shown below. This Matrix [M] has 3 rows and 3 columns. Each element of matrix [M] can be referred to by its row and column number. For example, a23 = 6. Given 1’s, 2’s, 3’s ……k’s print them in zig zag way. Maximum and Minimum in a square matrix. Given a Boolean Matrix, find k such that all elements in k’th row are 0 and k’th column are 1. Find sum of all elements in a matrix except the elements in row and/or column of given cell?